Review: Detectives, mysteries, and twists are all in the thrilling book, The Adventures of Jack Lime. Written by James Leck this book is fantastic. Jack Lime is a detective who solves other people’s problems. This book is a combination of three of Lime’s most interesting cases. If you like mysteries and suspense this book is for you. Jack Lime is a detective, Private Investigator. He solves problems for people for a favor in return. Sometimes the cases get hard, but he never gives up. One adventure he has involves a banana-streamer-small bike, a little boy, and a sister who is very protective. This case has a much unexpected turn towards the end. Another case is of a missing hamster, or did it really go missing? Maybe it got stolen to black-mail someone, but who really knows? He only stays in the business of solving mysteries because of one person, Tobias. Tobias is a smart, scheming person who will do anything to get some money. Jack Lime will always try to catch Tobias in the act of stealing money or something valuable. Jack Lime is a smart detective. Will he stay in the business and keep solving problems or live a normal life? What will happen to Jack Lime? The Adventures of Jack Lime is a spectacular book! It is thrilling and has many twists. I couldn’t put it down for a second. I liked how James Leck made it so there are a lot of twists and unexpected endings. For example, there is an unexpected ending in the case of the broken lock. It made the whole story better. Although The Adventures of Jack Lime is a fantastic book, there is one thing I didn’t like. In the cases Lime was working on, it skipped to things that didn’t make much sense. For example, in the case of the daily telegraph, Tyrone didn’t have his hamster and Lime was talking to the guy who took his hamster, Wally. Then, the next part Tyrone had his hamster back. So I was confused there until I read it over a couple of times. Other than that the book is amazing. I like how James Leck wrote the book. I can’t wait to read another one of James Leck’s books. We would like to thank Raab Associates, Inc. for providing a copy of The Adventures of Jack Lime for this review. 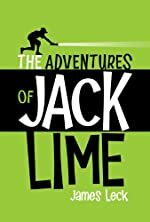 Have you read The Adventures of Jack Lime? How would you rate it? I read this book too and really enjoyed it. I especially liked the way the characters and plots were patterned after the classic noir mysteries. Here's a link to my review. It is a nice story which is applicable for the high school student since I think almost all situations happening in the story is also happening in real life as a student. Hoping to have another set of story like this.